Click here to order Raychem Cerapro. The cable exists in pre-terminated lengths. With output from 160-1140W) to cover 1 to 11m² floor surfaces. • Ultra thin for no additional floor height (3mm). • Output variable depending on heat requirement. • Exceeds the highest IEC standards for electrical heating cables. (IEC60800). 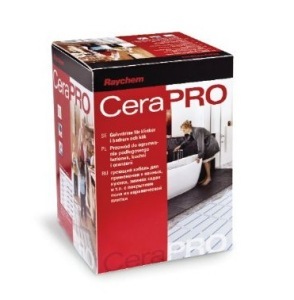 • The professional solution for tiled bathrooms, kitchens and conservatories. Raychem CeraPro information and installation guide.